Look at this. I got a letter the other day. A proper, handwritten letter – bursting with news – that someone had taken the time to sit down and write, put a stamp on, and take to a postbox. Isn’t it a thing of beauty? And isn’t it sad that it’s such a novelty to get one these days? I used to write letters all the time. We moved house when I was seven or eight – well before email or texting was the norm – and the only way I could keep in touch with my three closest friends was by writing to them. I have no idea how we managed to keep it up so regularly, but we would write each other long letters at least fortnightly, sometimes weekly. We turned it into an art form; using pretty paper, coloured or scented pens, and lots of stickers or ink stamps around the edges. Occasionally we’d include photos of ourselves, and then as we got older we started swapping posters or magazine cuttings about our favourite bands and actors instead. There was always such a huge sense of anticipation when I got home from school and saw that a letter had arrived. Having to wait a week or two for news heightened the sense of drama in our lives. So – even though the cliff-hanger from last week’s letter would only be ‘will this friend have plucked up the courage to tell the guy in the year above her that she fancies him?’ or ‘will that friend have found a dress for the disco?’ or ‘will the other friend have managed to get that stinky French essay in on time?’ – I was genuinely excited to open every letter and get an update. While I am as active as anyone on social networks like Facebook, and love being able to keep up with my friends’ news so much more easily and immediately now, it still makes me a little sad to realise that the sense of anticipation I loved so much has been lost somewhat. Now when something happens you find out about it right away. The other thing about email is that while it’s easier to keep records of entire conversations you’ve had with friends, you rarely go back and read them, and you rarely ‘stumble upon’ an old bit of correspondence like you do with handwritten letters. My paper filing system is non-existent, which means that while I’m searching through boxes for something dull like a bit of paper with my last meter reading on it, I’ll quite often chance upon an old letter which will bring back a flood of memories. Sometimes that can be quite a sad thing – I found a beautiful letter the other day from a close friend who has since passed away, and it left me feeling very nostalgic. Other times – like the other week when DorkyDad found a letter I had written to him just after we started dating – it can just lead to a right good laugh. None of this is to say that I’ve given up letter writing entirely. I still write to a few family friends every month or two because they’re not on email but they like to be kept up to date with how DorkySon is doing. And I’m still very strict about doing thank you letters. We had it drummed into us as children that it’s so important to have manners and say a proper thank you for any gifts that you get at Christmas or on birthdays – and that’s something I’m continuing in bringing up DorkySon. He was sat down with a pile of coloured paper and paints on Boxing Day and instructed to do a thank you picture for everyone who had sent him something! When I got my lovely handwritten letter through the door the other day, I was on my way to the train, so I took it with me and read it en route to London. Then I immediately got my phone out and started composing a reply by email. But when I’d signed off and I was about to hit send something stopped me. It didn’t seem right to respond to something that had obviously taken some time with something that I’d dashed off in ten minutes. So I trashed it. I’m going to wait until I’ve got time to sit down and send a proper letter back. I’m going to write it by hand, on nice paper. Then I’ll whack a stamp on and carry it to the post box. Heck, I might even buy some sparkly stickers to put on the envelope! What do you mean that’s a bit much? Some strawberry scented pens? No? I still appreciate a hand written thank you note or letter–as few and far between as they come. I try and keep this in mind when I’m tempted to blast off a quick thank you note to someone via email that maybe picking up a pen and paper would make it more meaningful. Great post! I’m a big handwritten letter fan. I still write to some relatives who are not on email and up until a couple of years before she died my Gran and I used to exchange regular letters. She died a year ago, but I’ve still got many of the letters that she sent me over the years and it’s lovely to sit down now and read them again. It’s painfully sad to read some of them, but I’m so pleased that I have them still. I recently bought some new writing paper as part of a new year’s plan to write to some old friends that I’m at risk of losing touch with. I’ve not yet sat down and actually written to them, but after reading this I’m going to make sure I make time to do so this weekend. It’s lovely having old letters to look at, isn’t it, even when they’re a little sad. Wish I’d written this post! I believe I keep Royal Mail going single-handed. I’m blundering my way through Twitter, but only really feel at home with a sheaf of Basildon Bond and a fountain pen. Two relocations in quick succession have separated me from most of my friends and the one advantage was that I discovered a couple to be irresistibly fine letter writers (it was a discovery for them, too)!. It’s odd how domestic trivia that would bore you in a phone call is compelling when noted in pen and ink and how closely you bond with someone mentally when writing to them. I recently wrote to a friend whose father had died. She said when her mother died 20 years ago her doormat was piled hight with letters of condolence; this time she only received the one. It’s very true – the kind of thing that would make me roll my eyes if someone shared it on Facebook is somehow much more endearing and lovely in a letter! That’s very sad about your friend. Those kinds of letters are the hardest to write, and sometimes it’s a real struggle to find the words – but they can bring so much comfort. They’re so good to receive at a difficult time. No comparison, but when we moved house and I was struggling to adjust over the first week or two, getting a New Home card in the post absolutely lifted my spirits. It’s so good sometimes to know that other people are thinking of you. I agree! I love receiving letters. I have a friend that I am friends with on Facebook, but we still keep in touch through written letters because we always have since we were teenagers. There’s just not as much time to write them now, but when I do they always end pages long. (I do wonder if I might be boring the recipient, but then I think about how much love to read all their news in a letter!) I also agree about thank you notes. I always hand-write thank you letters and teach the children to do the same. Ooh wow, hand made stationary – how lovely! That’s funny that your writing has got worse – I find that my hand gets so achey if I write now, because I’m so out of practice! What a lovely post. I have to admit the only ‘letters’ I write these days to friends/family are the handwritten notes I put in Christmas cards, bringing them up to date on our news – usually with a fresh picture of the boys. What I find sad is that, with all the technology around these days, people still say they’re ‘too busy’ to keep in contact. You could forgive them in the days of the handwritten letter. But in a time of text/email/Facebook/Twitter/etc, it becomes blatantly obvious who values relationships and who doesn’t. Lovely picture, lovely post. I used to love writing letters and receiving them. Sad that I am saying that in the past tense! I’ve been journalling for the last few months and I was wondering why I’d never journalled before – then I remembered all the years where I was easily writing 10 or 15 sides of A4 a week in letters! (My mum was a prolific letter-writer and so were some of my friends.) I’m sure that must have had a similar effect in processing things. Actually, when I started journalling, I was getting a really sore hand from writing 3 pages of A4, I needed to build up my writing muscles again! It is lovely to get something personal through the post. I dip in and out of journalling – it’s a shame that it’s usually something I do if I’m going through a miserable spell – it’d be nice to journal the happy stuff, but I guess that’s what the blog is now for! I completely agree about getting out of practice at writing. Even in uni – because we typed all our term essays, the hand written end-of-term exams were always so difficult! I’m so glad you resisted the email reply. You friend will no doubt appreciate the letter in the mail and I hope you find it’s as much fun to write as to receive! 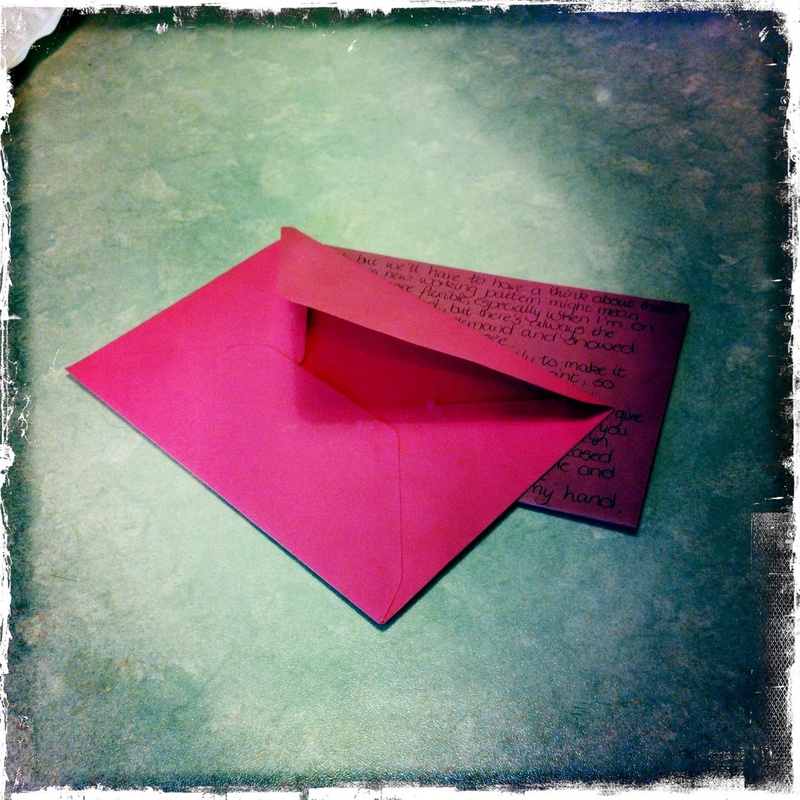 Here’s to a 2012 filled with letters! Times have changed so much haven’t they. I still love to receive hand written notes, despite the fact I am bombarded by electronic versions of the same. Probably because they are not the same really. Maybe because a handwritten note says that you’ve put time and thought into the gesture, and therefore time and thought into letting you know they are thinking of you and value you. Lovely post. I do hope you can take a look, perhaps you can even take part yourselves and tell your friends, it would mean a lot. Thank you for your time, kindest regards.